When you are able to locate an archive that has been hidden and secret for many years that is exciting. I have recently done this. Hence my silence here for some time. It has been a hard work that has kept me up working on the night shift skulking through the shadows, committing forbidden acts in my dreams, at weekends and “on holiday”. I have recently located an archive that reveals surprising additional family history knowledge. It’s not shocking or surprising but its codification is and thus the legislative framing makes me tremor. I am told I mustn’t reveal this information, but it’s my history too. My life’s work is autobiographical performance, so you can see why I have a problem here. Whilst I can build a more honest family tree with this new material, the deeper I dig the more responsibility I bring to the new material invoking the evil eye of the gatekeepers and the understandably guarded stand from living relatives. This is not new for me, this is not new, this is not new…..for me. In 1997 when we were researching “Looking for the Tallyman” it was easy to locate materials that told stories since 1930 and beyond and so we were able to easily share documents with community research partners (I mean family and friends) with ease; the photocopier working overtime and the self published book a delight to create. But it is 2015 and very different in terms of security, information and the ethical code that act as censorial gatekeepers. I understand why but I don’t think I have been dealt a fair hand here. 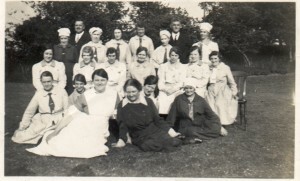 For “The House” I want to learn about my Nana in Hospital’s life in an institution 1934 – 1968 . This has meant me and mum asking for mum’s child protection records by reason of her adoption. It takes at least 8 months to release this stuff through the Data Protection Act of 1998. I have many questions about this story since aged 9 I learned the mysterious yarn that put my mum’s childhood story in the the fairy tale world of foundlings, changelings and bogey men in the wood. There is an interesting unwritten rule book held by a stern gatekeeper here who holds a firm grip around the negotiation of personal information that is second hand and second generation. I am now not speaking personally here but metaphorically. The system set up for divulging this information is well organised with accompanying professional social workers who are trained in the way to impart the information to clients along with the necessary warnings to additional interested relatives. If you want to know anything “secret” from 1930 onwards you will now be lucky to get it. Having got lucky or not depending on how you view it I have been pondering the place of that archive on this public forum, indeed the place of it at all in my creative endeavours. I have been questioning the point of autobiographical performance, “truth” and the ethics of telling stories that are communally owned but very personal to very close relatives. “The House” is being researched through a combination of family history re-imaginings and interviews with professionals in current and previous positions that have their historical basis in the poor law; trawling through photographs of people I know who have been born into and lived in institutions supported by the welfare state; playing with the fantasies of “Les Misérables” and “Oliver” (oh, that has an exclamation mark I forgot !) as well as improvising through imagined scenarios peopled with workhouse inmates and officials. The above paragraph would not read well in an arts funding application. It is the “truth” of family history and how it plays out in ledgers and official documents that has intrigued me most and the paper trail left behind: unimportant insignificant people whose stories do not form the books about kings, nobles and notorious rogues. I am intrigued by the little people and the breadcrumb trail that is left behind leading me in a Red Riding Hood quest to knock on a door that has been for some considerable time closed and locked. Grandma has wolves’ eyes ears and teeth and the story takes me to St Audrey’s Melton, Suffolk. There you go. I have broken a promise. However I know I can safely seek here since it is 100 years since Nana was there, it’s just my source that is less than 100 years and I am not quoting that here, anyway I want proof. You can’t believe everything written in a public assistance ledger. It is not surprising that the gate or doorkeeper has now become the driving motif within the work I am doing on “The House” and a potent symbol of potential and refusal. This is the door kept by the porter who decides you have been here before the last 28 days was up. This is the door kept by the security guard who ensures you don’t “play up” and record your sanction dispute interview and that you leave peacefully if you have no further business. This is the door that leads to the library that gives you the pass and the forms and the rules for getting the information from the belly of the record office so long as you have no more than three at a time. This is the door that is kept by the social worker who receives the secret documentation trawled by the archivist who passes it on with a strong rubber stamp of confidentiality, who sends it on to another who passes it on with reservations, warnings and benign hummings and haaings to your own self inflicted gatekeeper who out of respect and commitment sets up a door that is a guarded blog that confesses and whispers that if you come and see “The House” you may find out the secret and if you chat with me afterwards I can tell you the story behind all of this and how I am drowning in all of this. The above to be read in one breath. This is an exciting not a terrifying experience, by the way.